A reciprocating saw is one that can be held by hand (single handled, if necessary) and given the task of cutting through drywall, old cabinets, steel, wood, stubborn wall tiles, and other items that need swift removal. This type of saw is used for home renovations – both by homeowners and home renovation specialists – and also in demolition to make light work of cutting down whole houses, boats, and more. A reciprocating saw needs to be built to last. It takes a lot of punishment between the material it cuts through, the debris that hits it as it’s cutting through the material, the reverberation of the saw and its motor, and its use over many continuous hours of sawing action. It has to be a bit of a beast to survive all that and still keep running when it is needed. We’ve looked for the Best Reciprocating Saw that comes with a powerful motor, delivers strong cutting action, is reliability over time, and is easy to use. The following reciprocating saw reviews delve deep into each of the three selected products that we’ve given the best reciprocating saw, best reciprocating saw for the money, and the best reciprocating saw on a budget stamp of approval. This is considered by us the best reciprocating saw on the market! The Milwaukee 6538-21 15.0 Amp Super Sawzall Reciprocating Saw is a heavy duty tool that comes with a five year guarantee. It is easy to see from the build quality that with good care, this power tool may last even longer. It is also our overall winner for Best Reciprocating Saw. The main claim to fame of this particular reciprocating saw is that it has a constant power technology that aims to produce a steady speed whatever load the saw is presently under. This means that whether one is cutting through a piece of brick wall or something a little bit more delicate, either way, the cutting motion will continue at the same speed. The motor driving this sawing action is a 15 Amp Milwaukee one. It has an overload protection feature that the commercial literature claims are the highest protection in the industry. The idea is that it will stop the motor overheating and burning out completely due to over-use or poor heat management. This is important, particularly for commercial users of this reciprocating saw, of which there are many, who would think nothing of using this saw for 8+ hours per day with few breaks. A home operator doing some home renovating, ripping through a wall or two to enlarge a space, still won’t likely put this tool through many consecutive hours of use, but commercial users are a different story entirely. The clutch, which has a patented gear protection built-in, is designed to withstand sudden jerks to the mechanism when the tool suddenly hits a particularly resistant piece of a wall or other impediment. Such blade lockups send forces down to the clutch, but this one does well to not transmit those through to the operator. 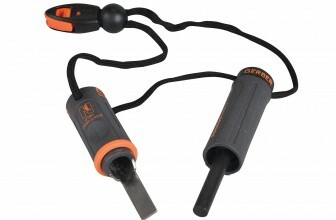 The handle is designed around a patented mechanism that acts to counterbalance the weight of the tool in the hand. 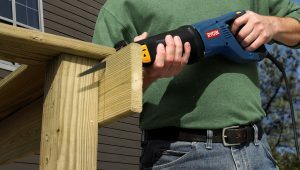 This aims to keep the vibrations less noticeable during use, which will be helpful to long-term users who could otherwise find themselves suffering from the negative health effects of exposure to vibrating power tools. An easy dial speed control is simple to adjust, even in bridge sunlight, where it is not so easy to see what speed the saw is currently set to. A trigger is also able to let the operator change the sawing speed that the reciprocating saw will operate at. 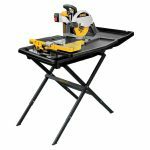 The DeWalt DCS387B 20-volt MAX Compact Reciprocating Saw with Tool is a handheld model that is battery powered. It is our winner for the Best Reciprocating Saw for the money. This DeWalt is both lightweight and also compact, which makes it more suitable for home renovations completed by either a man or a woman. The tool itself is just 14.5-inches in length, so it can fit into confined spaces without any difficulty and also takes up little room when not being used. The tool can even fit between the studs to drill exactly where it is needed, which larger reciprocating saws simply cannot manage to do the majority of the time. Usefully, there is a blade clamp that can move into one of four different positions. The pivoting shoe delivers more versatility still. These offer flexible access for flush cutting and pointing the blade towards tight corners that otherwise couldn’t be accessed successfully. Each blade can be released easily without needing to use a tool to do so. The 1 1/8-inch stroke length with the blade is standard with these types of saws. There is a speed trigger which can vary the speed from 0 right to 2,900 SPM. This level of control is excellent for only using just enough sawing speed to cut neatly through old fixtures, drywall and other unneeded elements in a room, without overdoing it by using too much power and cutting further than one intended. There is a nice LED light which illuminates the work area. When the power is turned off to prevent accidental shocks, the illumination that the LED provides, particularly in small, dark corners of the room, is most welcome. Batteries are not included with this product. They have to be purchased separately. It is a good idea to buy the Dewalt 20-volt lithium batteries to reduce the running costs of this saw. When renovating or remodeling part of a home during spare time on the weekend, perhaps, make sure to have at least one spare set of charged batteries available to avoid a work stoppage. The Makita JR3050T 11 Amp Reciprocating Saw is our winner in the Best Reciprocating Saw on a budget category. This saw model can also be bought with a six pack of blades, which is not much more expensive than the basic model and well worth it. 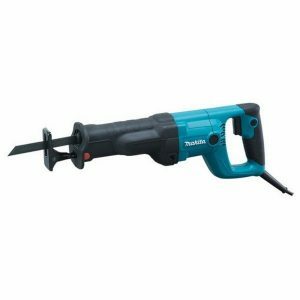 The Makita JR3050T is a corded, double insulated, electrical reciprocating saw that runs using an 11-amp motor to power it. 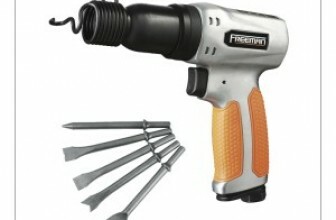 This power tool is designed using bearings with ball and needle features for durability over time. A rubber boot protects the bearings and motor from collecting debris or dust during use. Parts can be removed fairly easily from the main unit and often this can be done without needing separate tools to do so. The saw stroke is 1 1/8-inch, not unlike other similar saws of this type. It offers the ability to change shoes easily without the need for tools. Blades can also be swapped out when they’ve become dull or have broken off, and this also doesn’t require a tool to complete this task, unlike some other reciprocating saws in the market. The grip is soft and comfortable to use during a long day. A variable two finger speed trigger, with lock on, is present, which allows the operator to vary the speed of the saw depending on the needed application. The speed can be adjusted between 0 to -2,800 SPM. This level of fine operator control is ideal to ensure that only the right area is cut, to the appropriate amount, and no more than that. One unusual feature is a dust blower, which is built-in and cleans the cutting line to make it easier to see what is being cut and avoid mistakes. The saw is 17 ¾-inches long and it weighs 7.3 pounds. The weight is not so heavy that it will cause fatigue for the operator too quickly. There is a purple plastic case adorned with the Makita logo that allows the saw to be packed up and stored away from sight when it is not needed. The unit comes with a one year limited warranty on parts and labor. A reciprocating saw, along with perhaps an angle grinder and hammer drill, are necessary tools when working on demolition or general construction jobs, or a home renovation project or two. To cut efficiently through drywall, and other building materials, that need to be cleared quickly, a reciprocating saw is an ideal tool. The 1 1/8-inch stroke length makes short work of such obstacles and the number of osculations mean that the saw can complete its assigned task in record time. Other types of heavy duty machine saws have specific purposes. Like a circular saw or a wet tile saw, but with the reciprocating saw, the ability to put it to a varied selection of construction or demolition tasks, is handy. It is pretty multi-faceted in that way and a good tool to have in the arsenal. The motor drives the reciprocating saw, with it being important to have one that is powerful enough for the task. It takes the manual labor out of the task, though, with the motor doing most of the heavy lifting when needing to access part of a wall or drill a hole to add a new lighting fixture. The one thing that drives an effective reciprocating saw is the motor. It needs to have enough amperage to power through stubborn walls that don’t want to be drilled into. Ten or a greater number of amps should be sufficient. Along with a good amount of power behind the motor, it is useful to have an overload protector built into it. This avoids the motor overheating and then burning up in the process. Motors or motor parts can be expensive to replace and cause downtime on the job, so this is not something one should want to skip, unless the tool will only be used occasionally at home, for limited periods of time. The mechanism for the saw needs to have a way balance out the vibrations that moves up from the blade to the handle. Ultimately, these can feel like the operator is holding a jackhammer drilling into the concrete road if they’re not careful. Some manufacturers have designed their own patented mechanisms to mitigate the issue of vibration through the machine, with impressive and less than impressive results, depending on the manufacturer and the model of reciprocating saw. Easy adjustment of the speed of the saw is nice to have access to from the main handle. To have to stop sawing just to manually change the speed, to have to go through this process each time, can be rather annoying on the fifth occasion. There are different kinds of blades which can be used, made by various manufacturers, so it is nice if the saw can accept different blades, rather than only ones made by the saw manufacturer alone. Most construction workers want flexibility in the blades they use, often using specialized ones for different tasks, while using the same reciprocating saw. A longer stroke length helps to saw more efficiently through the material. Quite often, a saw of this type will offer a 1 1/8-inch stroke length, which is perfectly fine. A reciprocating saw is a powerful tool that will cut through most things when given the opportunity. Care needs to be taken when cutting in more delicate areas that need some patience to get right. In fact, it can be beneficial to think about owning a heavy duty reciprocating saw and a smaller, lighter brother for the more delicate sawing tasks. In many cases, a reciprocating saw needs to be able to get into tight spaces to drill. This can even mean drilling between studs, at times. Therefore, it is useful to think about the build quality, the shape of the saw, and how easy it will be to be held, angle and move around over an extended period of time. A carry case should come supplied with the reciprocating saw. This is not always true. It should certainly be large enough to pack up the saw, and all its accessories, to put the saw in the back of the work truck for transportation to the job. Where some saws let the side down a little bit, is where the case doesn’t leave enough space for many types of blades to be stored inside. Sure, there is sufficient space to add a small handful of blades, in a single size, but many construction workers wish to include various types of blades and not all cases permit this. The Milwaukee 6538-21 15.0 Amp Super Sawzall Reciprocating Saw is our overall winner for Best Reciprocating Saw. 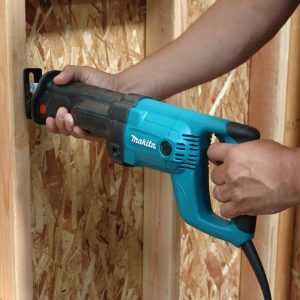 This corded power tool focuses on providing a steady amount of sawing power, using its own patented constant power technology. The steady sawing speed, at whatever speed setting has been established, makes it easier to know the speed that the saw will cut through building material. Whilst different types of material, like drywall or chipboard, will need different amounts of force to cut through to clear them, the consistency of the cutting speed is still a useful guide for the operator of this tool. The real power behind this saw has to be its 15 Amp Milwaukee motor. It is one of the more powerful ones in its class. The overload protection is stated as offering a higher level of coverage from power overload than with other manufacturers. It is easy to believe that. Overheating with any power tool is a major concern for demolition, and other types of workers, for whom an overheated motor could mean the end of the work day. Losing use of a tool with a motor that is allowed to get too hot, can fry components that are not easily (or affordable) to replace. In the case of a reciprocating saw, it is not unusual for a construction worker to use this type of saw for a full work day, so it needs to last the duration. The clutch that comes with this saw has a patented gear protection system. The mechanism, which Milwaukee has paid special attention, aims to not feed vibrations and jerks through to the operator. Things like blade lockups can easily push forces up to the handle on a the power tool, but thankfully this is far less the case with the Milwaukee 6538-21 15.0 Amp Super Sawzall Reciprocating Saw. With the design of this saw and the handle too, it is clearly intended to be carried by the operator, for hours, without difficulty. Effort has been made to ensure that the design distributes weight well. The easy speed dial control is near the handle and there is a multi-speed switch to control the trigger easily too. The build quality of this Milwaukee Super Sawzall is second to none. This has been achieved whilst making the saw lighter than previous generations due to the use of modern materials. Whilst we would not recommend it, some plumbers even have been known to climb up ladders, perform a task, and drop this tool from a height to avoid needing to climb down the ladder again, and this reciprocating saw still survived. 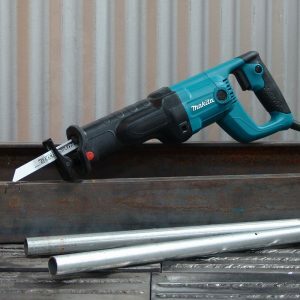 Certainly, it is robust enough to handle the rough and tumble of life on a construction site, even when the tool is being shared among a bunch of workers who don’t always give it the love it deserves. One nice feature with the latest version of this Milwaukee saw is that it is easy to make a fast blade change. With the previous model, one had to use an Allen wrench to swap the blades over when they became worn or simply broke. With extended use on construction grounds, dust and debris may clog up the machine. It will be necessary to perform some maintenance from time to time to clean up the saw. In such situations, with large work crews, it would be a good idea to own several of these sawzall saws, rather than just rely on one, to avoid unexpected downtime. For home use, this is unlikely to be much of a problem. The case is large enough to include the reciprocating saw and the accessories. It is no longer aluminum, like the previous model and is now simply plastic. One negative with the case specifically is that it doesn’t have much additional space. Any construction worker who wishes to add a variety of different sized blades for use with this tool will struggle, because the case just doesn’t have enough space for that. For this reason, the extra blades will need to be carried in a separate bag (with previous Milwaukee saws, this wasn’t the case at all). The case does have space for a few blades that come with the saw though, so it is not a complete loss. Outside of the construction arena, it is not unheard of to hear about people who use this saw to cut down small trees in their yard. It is not exactly a hedge trimmer and shouldn’t be thought of as such, but theoretically, at least, it does have a similar sawing capability of such tools. This power tool does come with a five year guarantee. One of the parts that seems to get broken more often than others is the spindle. In a situation where a part has been broken inside of the 5 year guarantee period, Milwaukee will fix the tool for the owner. 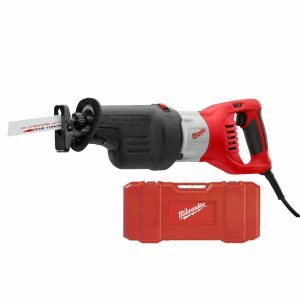 The Milwaukee 6538-21 15.0 Amp Super Sawzall Reciprocating Saw is the Best Reciprocating Saw, because it is a heavy duty, durable saw that comes with a lengthy guarantee and is well respected among construction workers. Its previous generation of sawzall saw (Milwaukee actually created the first of its kind) were equally popular too. The DeWalt DCS387B 20-volt MAX Compact Reciprocating Saw with Tool is our winner for the Best Reciprocating Saw for the money. This bright yellow and black colored power tool is a handheld saw that is ideal for smaller home renovations, remodeling projects, and limited application for plumbers and other workers. 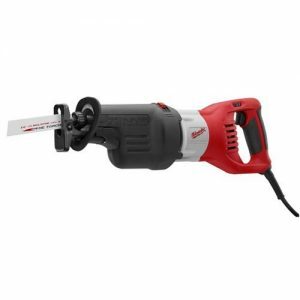 Whilst it has the same cutting depth as other more robust, cord powered reciprocating saws, it is intended to be used free from a tethered electrical cord connection and able to get into tight spaces to perform a cutting action. The saw can cut through lumber and also copper pipes. Whilst it is certainly durable, it probably should not be the main, or only, reciprocating saw of choice for a long day on the demolition site. 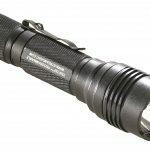 The tool is lightweight and pretty small for the power and cutting action it is capable of producing. Measuring only 14.5-inches in length, it is easy to hold in one hand, swing around, angle into position, and then store away later, taking up little storage space. The 20-volt motor is powered by rechargeable batteries, which need to be purchased separately. The Dewalt 20-volt lithium batteries are capable of delivering a fair amount of cutting power, because the speed can be varied depending on what the operator requires at that moment. The unit will get hotter over extended use without breaks, as do the batteries as well. When it comes to the batteries, it is possible to use Dewalt 20-volt lithium batteries to power the unit. However, it is a good idea to have a couple of sets of these lithium batteries to avoid finding that your battery set has no charge left. The batteries do get used up fairly quickly – faster than most operators would think – so do be aware of that. The Dewalt charger will show when there is only one cell left. Lithium ion batteries should not be allowed to discharge their charge right down to 0%. This is then the time to remove the battery, let it cool down, and place it in the charger. The Dewalt charger will not allow the battery to begin charging until it has cooled sufficiently. The DeWalt DW4856 blades (which can be bought in additional packs of six) are capable of cutting through wood and metal. The saw has a 1 1/8-inch stroke length, which is pretty standard with these types of reciprocating saws. There is no loss of stroke length by choosing the handheld model, which is nice. A speed trigger is easily accessible and permits the operator to change the speed from 0 SPM up to 2,900 SPM. This gradual speed increase is helpful to ensure that the operator doesn’t accidentally use excessive speed to cut deeper into material than they intended, a reaction that cannot be undone once completed. The blade clamp is able to be moved into one of four positions. This provides considerable flexibility when using the saw. The pivoting shoe is also a nice feature that further extends the ways that this saw can be used in smaller spaces. The lightweight nature of this reciprocating saw makes it an easy one to hold for extended periods of time and use one handed pointing into a confined space. The reduced arm fatigue due to the lighter weight and balanced design will be pleasing to anyone will less upper arm strength than they would like. Simply put, this saw can cut into corners where a larger model like the Milwaukee 6538-21 15.0 Amp Super Sawzall Reciprocating Saw cannot. This is one of the main attractions here. For those times when working near light fixtures and the electricity has been turned off for safety reasons, there is an LED light that lights up the work area. This is an excellent addition and ideal for a lightweight, handheld reciprocating saw like this one. 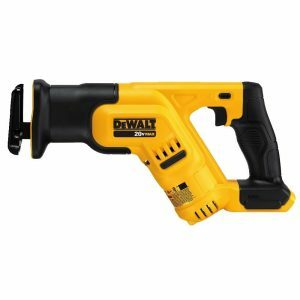 Returning to the subject of battery power, there is an alternative DeWalt reciprocating saw power tool that comes with a built-in lithium ion rechargeable battery, rather than needing to buy separate Dewalt 20-volt lithium batteries batteries after the purchase. The DEWALT DCS387P1 20-volt MAX Lithium Ion Compact Reciprocating Saw Kit is the same as the reviewed model, except for the included lithium batteries, so both come equally recommended. The Makita JR3050T 11 Amp Reciprocating Saw is the winner of our Best Reciprocating Saw on a budget category. This reciprocating saw is a corded electrical model, which is double insulated for the operator’s protection. It is powered by an 11-amp motor that is capable of delivering up to 2,800 SPM putting this saw up near the top of the powerful cutting tools available in the market today. The design is fairly robust. Ball and needle bearings are covered by a rubber boot which protects the bearings and the motor from collecting stray dust, wood chippings, and other debris that the sharp blades chew up. This thoughtful feature ensures that the saw is far less likely to break down during use due to getting clogged up. The same saw stroke of 1 1/8-inch is offered with this unit. The shoes can be swapped out conveniently without needing to find some tools to make that so. Blades can also be removed and replaced with a sharper version or a different type of blade, as the need arises. This can also be performed without needing to use any tools to do so, which is a nice surprise. While the operator is well advised to use a strong pair of insulated workman gloves whenever using any power tools, the grip is soft and comfortable to use over extended periods of time. Inside the handle is the two finger speed trigger, with a locking feature. The speed trigger lets the operator adjust the speed from 0 SPM up to 2,800 SPM, which is likely to cut through anything from a stubborn piece of wood right up to old copper piping. The degree of granular speed control is helpful here, because some materials are delicate and don’t need much power to cut through them. At other times, there are surfaces underneath or near the area being cut through that the operator doesn’t wish to touch and the cutting speed needs to be adjusted down to ensure the blade doesn’t cut right through the intended material and move directly to the secondary surface. What does surprise is the dust blower that is included in a reciprocating saw at this price point. It is able to blow air towards the cutting line to move away small particles that can obscure the line that is being cut. This will be extremely helpful to inexperienced operators and experienced ones alike. Cutting, using this model, is successful on a range of materials. It will often cut through steel okay, but not always. The blade is long enough to cut through half an inch of drywall and 2×4 timber, but for wider cuts, a commercial reciprocating saw, like the winner in the Best Reciprocating Saw category, would be a better choice. With that said, for home improvement projects, this budget offering has a lot going for it. With the addition of a 12-inch wood blade, it is possible to use this saw as a trimmer around the yard with some success. The unit is not too heavy at 7.3 pounds. It can certainly be held in one hand, but it is also possible to use a steadying hand in front of the handle to make the use two handed, which would be more comfortable. The saw is 17 ¾-inches long, with the attached power cord extending that length. A purple colored plastic case with the Makita Logo is included. This case can store the saw, accessories, and blades too. It is fairly strong and should be durable over time. The buyer has the choice of buying the main unit or one with a package of six blades for a slightly higher price. This reciprocating saw from Makita has a one year limited warranty on parts and labor. The Makita tools are now manufactured in China, but clearly the company is maintaining high levels of quality control with their products, which is good to see. Sawzal saws are used for sawing into or across the material that is to be cut. Small motions are usually best to gradually saw through the material, rather than rough actions that could cause the blade or some internal part of the machinery itself, to break. Generally speaking, these types of saws, when designed for construction workers, not homeowners alone, are pretty robust power tools that are built to last. The blades will need to be changed and there are many different types which can be used for different applications (no one size is appropriate for all sawing tasks; shop around for good blades). The blades, when included with the reviewed models, were all well constructed, but it is always good to have other options. It is possible to purchase a battery operated sawzall saw, rather than a corded variety. The reality, in most cases, is that for heavy duty construction work, the battery operated saw just won’t be powerful enough for all day usage. There will always be the question of whether it will run out of juice in the middle of the job. It is just not worth the risk to make a battery operated saw the main one for people who make their living working on plumbing, or at a construction or demolition site. With that said, a smaller reciprocating saw that is battery powered has the ability to fit into smaller areas, a good distance away from an available power source. This can be quite useful under specific circumstances. When owning a battery operated power tool, make sure to have several batteries available for use. 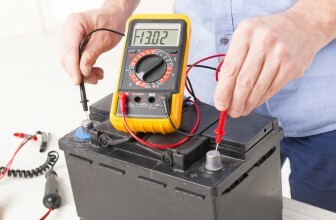 Batteries get burned through pretty quickly with power tools and don’t last anywhere near as long as people expect. Be prepared for that eventuality. A good sawzall saw will last many years. Owners of older sawzall saws often find that they are unable to buy a replacement part that’s broken on a 5-10 year old reciprocating saw, with that being the often cited reason for replacing the product, rather than because the saw actually stopped functioning altogether. There is a benefit to owning a large sawzall saw and a smaller one too. This is because with some tasks, the operator needs to get into a small, contained area and still be able to move the reciprocating saw around within the space, get the right angle needed, and complete the sawing action. With larger models, this can be tricky, and sometimes impossible. With the optional second, smaller reciprocating saw, this provides a second choice. With smaller bathroom remodeling jobs, for instance, space might well be at a premium, at which point, the operator will be glad they owned the smaller sawzall saw too. When using any reciprocating saw, be sure to wear strong, insulated workman gloves and some eye protection too. A reciprocating saw is an excellent tool for cutting through anything from drywall to copper pipes. Some people even cut wood in their garden with them, though this is not really recommended. A decision needs to be made whether to buy a larger, commercial sawzall saw or a smaller one. The differences will be mainly one of brute power and access to enclosed areas. With the smaller variety, saws with also commonly run on lithium ion batteries. This is a bit of a good news, bad news situation. It does allow a smaller unit to fit into enclosed spaces while running under its own power, but the batteries run out of juice fairly quickly. The smaller reciprocating saws are perfectly fine for many uses and actually use the same blades, with the same cutting length, as the larger models. However, for demolition jobs and extensive renovations, a bigger tool is going to be the better option. Where one can afford it and the renovation job would benefit from it, there is the third option of buying a larger, corded reciprocating saw, along with a smaller, battery powered one.